Last week I stopped at Bethel Beach to snap a few photos. There was nothing terribly exciting to photograph, just the usual. Sky, water, marsh grasses. Same old, same old. After snapping a few pictures, I started towards home. I happened upon some mischievous goats scampering along the roadside. They were also scampering in the road. This bunch escaped from their pen before. and they're going to enjoy every second of it. The one on the left is saying, "What are you lookin' at?" The one on the right is saying, "Bite me." Really, I heard them. Loud and clear. So, a routine jaunt that started out boring ended with a baaaaaang. CBW--I love it when goats run amok. The sea, sky and sand are "same old, same old" to you sometimes, but I know you realize how lucky you are, at the same time. Happy Monday to you & yours. The beach pictures are amazing, as always! I could sit there and watch the water all day long. LOL. Now I want some cheese. And wine. I love goats, particularly baby goats....they are so cute. Hopefully, you gave their owner the heads up that they were loose? I think goats are funny. I've been following the blog of a woman in West Virginia trying her hand at farming. She's doing pretty good with her assortment of cows, chickens, goats, geese, donkeys and what ever else she can herd. The babies are wonderful. Should check her out at www.chickensintheroad.com. Anonymous/mathews mark: I never cease to be amazed at your stories. You should write a book, for sure. I won't even ask how you got all those goats onto the field. Middle Sis: The goat pen is in the yard of an old house that nobody lives in otherwise I would have told them. This bunch springs free often, and every time I've seen them wandering around they don't go far. Of course standing in the road is not exactly safe, but I scurried them back into their yard. I am about to buy a house on the Northern Neck, in Lancaster just outside of Kilmarnock. I can't wait to explore and learn all there to get to know this whole area. 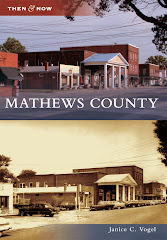 I love Mathews, Gwynn, Deltaville and all the other places that I have visited.